6.4 Earthquake hits the Kermedec Islands off New Zealand. 5.5 Earthquake hits the northern Mid-Atlantic ridge. 5.3 Earthquake hits Bio-Bio, Chile. 5.1 Earthquake hits Bio-Bio, Chile. 5.1 Earthquake hits the southeast Indian ridge. 5.1 Earthquake hits the Kuril Isalnds. 5.0 Earthquake hits Bio-Bio, Chile. Tropical depression Eleven is located about about 1070 mi (1725 km) ENE of the northern Leeward Islands. Had been expected to become a tropical storm Sunday. It should move in the general direction of the Gulf of Mexico. Tropical depression Eleven in the Central Atlantic will likely become Tropical storm Jerry today. Typhoon Wulip is located about 157 nm east-northeast of Da Nang, Vietnam. Expected to reach coastal areas of Vietnam today. Wulip, the 21st tropical storm of this year came into being in the Central part of the South China Sea. It will bring more than 7 grade gales to the east-central Guangdong coast of China and threaten the security of sea-related vessels and offshore work. It is expected that Wulip will move slowly at a speed of 5-10 km towards the west and the south sea surface of Hainan, its intensity strengthens gradually. Due to the joint influence of the cold air from Wulip and the southwest monsoon, there will be 6-7 level gales in Guangdong east-central coast. Wind force in the northern and central parts of the South China Sea is 8-9 grade and gusts are up to 10-11 grade. Tropical depression Twenty-One is located about 634 nm southeast of Yokosuka, Japan. Thailand and Cambodia struck with floods leaving several dead. Heavy monsoon season has flooded 27 provinces in Thailand, killing nine and forcing evacuations in at least nine districts. Thousands fled their homes on army lorries with food and water in plastic bags. Streets have been turned into waterways and cars replaced by boats. Many of the residents are too scared to leave their homes. So far, about 1.5 million people from 420,000 households have been affected. Elsewhere in Cambodia, floods have killed at least 20 and left more than 33,000 families affected. Approaching Typhoon Wulip will cause torrential downpours not only in Vietnam, but across the region, so the flooding is likely to get worse. The Chinese province’s meteorological department on Saturday morning launched a grade three emergency response alert. The meteorological department have already warned local fishermen operating in the central area of South China Sea to dodge the storm centre and avoid outdoor activities until further notice. Philippines – The death toll from monsoon rains rose to 31 on Saturday. The latest fatality died because of a landslide in Bauan, Batangas. Two others are still missing while eight were reported injured. The monsoon rain has so far affected 123,160 families, or 588,147 people, in 330 villages in 34 towns and 11 cities in seven provinces. Of these, 5,779 families or 25,087 people are staying in 103 evacuation centres. At least twelve miners have been trapped in a coal mine in Shanxi province in China. The Zhengsheng Coal Mine, near to Fenyang City became flooded early Saturday. At least 30 other miners have been lifted out of the mine shaft. 5.0 Earthquake hits the Bougainville region, Papua New Guinea. The 6.8 magnitude temblor that struck southwestern Pakistan on Saturday 96 kilometres northeast of the district of Awaran, killed at least 12 people in the same province where several hundred died on Tuesday from the 7.7 quake in which the quake toll has reached 515. Tropical depression Eleven is located about 960 mi (1540 km) ENE of the northern Leeward Islands. Expected to become a tropical storm today. Typhoon Wulip is located about 240 nm east of Da Nang, Vietnam. Expected to reach coastal areas of Vietnam on Monday. 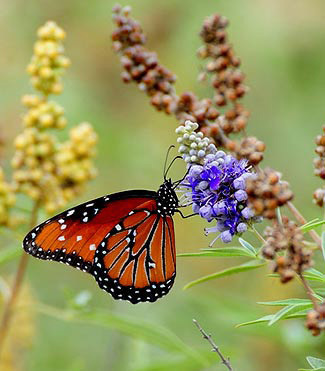 Clusters of colourful monarch butterflies are now in the midst of their marathon migration southward across a broad swath of North America, but observers warn their numbers have plummeted again this year. This year’s reports indicate that the decline in monarch numbers over the past 10 to 15 years appears to have been much steeper this summer. Biologist Jeremy Kerr told the Ottawa Citizen that he thinks numbers are now down by as much as 90 percent. Loss of habitat and pesticide use due to expanding agriculture is mainly to blame, according to experts. Last summer’s extreme drought in the U.S. corn belt wiped out huge numbers of milkweeds, which the monarchs need to breed and feed. Elizabeth Howard of Journey North says that was a fatal blow to many of the iconic fliers. Monarchs typically live only four to five weeks, except for the generation that emerges in late summer. That’s the one that migrates the entire way southward to the species’ wintering grounds in the Mexican state of Michoacan. The small number of southward migrants this autumn has caused even more concerns over the long-term future of the world’s longest-migrating butterflies. HIV infection rate down 33 percent worldwide since 2001 – The global rate of new HIV infections among adults and children has fallen by 33 percent since 2001, according to a new report that touts major progress against HIV transmission to kids. Despite the relief brought on by the recent rains across the Brazos Valley, the majority of the state remains in a drought. The Texas State Climatologist predicts the drought could last anywhere from 1 to 15 years. Officials point to the area’s water aquifer and the change of season as reasons such water restrictions are not required. It’s not all bad news though. While 80 percent of the state remains in a drought, the amount of “extreme drought” in Texas is on the decline. Levels of “extreme drought” have dropped from 28 to 8 percent. There’s bad news for much of the nation’s heartland – the so-called “flash drought” won’t be leaving as quickly as it began. More than 50 percent of the Midwest is in varying levels of drought. Drought in Iowa, especially the western half of the state, is slowly gaining momentum. Extreme drought returned to the nation’s leading corn and soybean producing state for the first time since April. More than 78 percent of the state is in moderate or worse drought. Minnesota, Wisconsin, Illinois and Missouri aren’t far behind. The “U.S. Seasonal Drought Outlook” doesn’t see much improvement for much of the Corn Belt’s drought through the end of year, meaning for areas from Minnesota to Missouri won’t be free from drought in 2013. Along the western edge of the Corn Belt, however, drought conditions are slightly more favourable. Just 11 percent of Nebraska is in extreme drought, down from 21 percent last week. While few farmers are excited to see drought, the drought did help save Nebraska rom flooding. Historic floods in Colorado moved into Nebraska this week, but before major flooding could sweep over the fields, drought-stricken land soaked up some of the floodwaters. These same floods that eliminated drought in north central Colorado bypassed much of the dry, southeast corner of the state. The worst of the drought currently persists in four counties in southeast Colorado, and it too is expected to persist into 2014. Drought is keeping a firm grip on states further to the west. Little to no drought improvement was made this week in Idaho, Nevada, California and Oregon. Most of these states will also be seeing drought through the end of year. A bushfire has broken out on Sydney’s northern beaches, cutting access to an iconic lighthouse. Strong vulcanian explosion from Sakurajima in the afternoon of 27 Sep (08:24 UTC, 17:24 local time); ash plume reached 13,000 ft. Activity fluctuates on a scale of few days, but remains at relatively high levels overall. Explosions from the Showa crater often follow each other at intervals of few hours, and ash plumes regularly surpass 10,000 ft altitude (something that had been more rare during the past years). Most explosions are of vulcanian type (strong fragmentation of solid material blocking the vent, generation of tall ash plumes, often with shock waves and explosion sounds) and more rarely strombolian, with mainly incandescent lava ejected in fountains of several hundred meters and only little ash. Following most explosions, the volcano usually continues to near-constantly emit ash plumes of various size for several hours. These plumes, when observed during the past days, were up to about 500 m tall, with sometimes weak strombolian activity visible reaching above the crater rim. New submarine volcanic eruption A submarine eruption started yesterday (28 Sep) NW of the island Jebel Zubair and SW of the site of the 2011-12 eruption. The activity manifested itself in form of a strong SO2 anomaly and steam plume spotted on satellite imagery. No signs of activity are visible on images taken on 27 Sep, which confirms that the eruption started yesterday. The presence of the significant steam plume suggests that the eruption vent is a shallow depth (less than 100 m), and possibly in the stage of producing so-called surtseyan activity (violent steam-driven explosions breach the surface with jets of water and steam, and become more and more rich in lava fragments as the vent becomes shallower). 5.0 Earthquake hits the Solomon Islands. 5.0 Earthquake hits east of the South Sandwich Islands. An area of low pressure east of the Lesser Antilles over the central Atlantic (Invest 96-L) is battling strong winds aloft around a nearby upper low. The upper low will move in tandem with 96-L and should be slow to weaken. This will inhibit significant development for at least the next day or two. Regardless of organization, 96-L will move northward and eventually northeastward and poses no threat to the U.S. Tropical Storm Wutip is still on track to head to Vietnam as an intensifying typhoon by early next week, then head inland over Laos and Thailand with a threat of heavy rainfall. Flooding in Cambodia has claimed the lives of at least 23 people in the last two weeks, and has affected about 56,900 families in seven different provinces. A dust storm has closed a 14-mile stretch of a state highway in the Casa Grande, Arizona, USA for nearly three hours. According to the Arizona Department of Transportation, low visibility and the multiple car crashes forced the closure of road. Gusty winds dropped visibility to less than 1 mile. Sometimes good science takes time. This week, more than five years after the fact, a report was released about a mysterious mass stranding of whales that made international news in its day, but has since been all but forgotten. Few will be surprised to learn that the cause was manmade ocean noise, which has now been implicated in a succession of mass whale deaths. And yet the findings were completely unexpected — and raise yet more questions about the sufficiency of existing law to address this growing international problem. 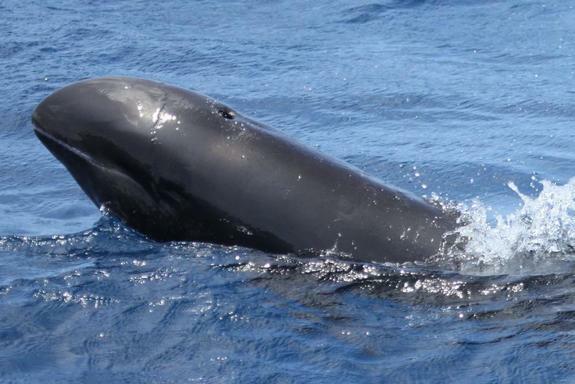 In May-June of 2008, the Wildlife Conservation Society led an international stranding response team to a mass stranding of approximately 100 melon-headed whales in the coastal mangroves of northeastern Madagascar. On May 30, 2008, a pod of some 100 to 200 melon-headed whales turned up in Loza Lagoon, a large mangrove estuary on the northwest end of Madagascar. The lagoon was, needless to say, an inappropriate place for pelagic whales that tend to spend their lives in deep water. Despite intensive rescue efforts by both local authorities and experts from around the world, including my colleagues at the International Fund for Animal Welfare and Wildlife Conservation Society, the vast majority of the whales in Loza proceeded to suffer, starve and die. The whole episode bore an uncanny resemblance to a mass stranding of the same species in Hawaii, during a major U.S. Navy exercise in 2004. In that case, an intrepid group of locals managed to lead the whales out of the lagoon using traditional methods — strands of woven vines gently pulled along the water’s surface — but Madagascar was the darker flipside of that event. In Hawaii only a single whale, a calf, is known to have died. In Madagascar, it was a true catastrophe. But what was the cause? At the time, attention immediately turned to Exxon, which was running exploration activities in the area. The high-powered airguns that companies use to find offshore reservoirs of oil and gas have the power to disrupt marine life on a massive scale, and have raised enormous concern among scientists and conservationists the world over. Yet Exxon hadn’t deployed airguns off Madagascar. Nor was it using any of the other intense human sources of sound that biologists have identified as an environmental threat. What the report demonstrates is that our understanding of the threat from underwater noise is too narrow. As it turns out, the “plausible and likely” cause of the Madagascar strandings was a seemingly innocuous acoustic device called a multibeam echosounder, which uses fans of sound to produce high-resolution maps of the sea floor. No one thought to worry about echosounders before now. For years, regulators have focused on industrial and military sounds of lower frequencies, on the assumption that higher-frequency sounds are more quickly absorbed by seawater and do not pose the large-scale threat of an industrial airgun or naval sonar system. And echosounders, which are widely used by fishermen and oceanographers as well as by industry, typically use frequencies so high as to be completely undetectable to any marine mammal. The echosounder that Exxon employed off Madagascar was, unfortunately, a very different animal. It produces sounds almost as powerful as the Navy sonar systems that have precipitated mass whale strandings and mortalities around the globe; and the sounds it generates are of similar, if higher, frequencies. Perhaps its only saving grace is that, unlike Navy sonar, echosounders are directed downwards towards the ocean bottom rather than directly out to sea, where the noise can spread even further. Even so, the report concluded that the Madagascar device would have ensonified the coast at levels known to disrupt whale behaviour for close to 30 kilometres in all directions. How widely are these systems used? That remains a mystery. But if there’s anything one can say about ocean noise, it’s that people are constantly underestimating the scale and scope of the problem. Bubonic plague, the deadly scourge that wiped out half of Europe during the Middle Ages, still lurks in pockets of the globe, new research suggests. Although plague is now rare in Europe, it recently sickened more than 10,000 people in Congo over a decade, and cases still occasionally emerge in the Western United States, according to a study published Sept. 16 in the American Journal of Tropical Medicine and Hygiene. Even during the 1900s, the plague still killed millions of people, but since then, the advent of better hygiene in cities and swift treatment with antibiotics has reduced this erstwhile killer into a rare disease. Still, plague outbreaks still flare up around the world. According to the new study, which tallied the reported cases of plague around the world between 2000 and 2009, more than 20,000 people became infected during that time. People contracted the disease via rodents, bad camel meat and sick herding dogs, the report said. Cases in Libya and Algeria re-emerged after decades of absence. The biggest burden was in Africa: in Congo 10,581 people contracted plague, followed by Madagascar with 7,182 cases and Zambia with 1,309 cases. In the United States during that time period, 56 people contracted the plague and seven died. The cases occurred mainly because plague has become endemic in squirrels and wild rodents in the American West. Two of the fatalities were scientists: one who had conducted an autopsy on a wild mountain lion, and another who worked with plague bacteria in the lab. Despite being a hotbed of plague in times past, Europe logged very few cases of the disease in the past decade. That may be because European cities keep their rodent populations in check, so the potential hosts for plague aren’t as prevalent, the researchers said. 5.2 Earthquake hits Luzon in the Philippines. Tens of thousands of survivors of Pakistan’s earthquake waited for help in soaring temperatures Thursday, as the death toll rose past 350 and anger grew at the at the slow pace of government aid. More than 100,000 people made homeless by Tuesday’s 7.7-magnitude quake spent a second night in the open or under makeshift shelters as response teams struggled to reach the remote region in the southwestern province of Baluchistan. The quake is Pakistan’s deadliest since the devastating Kashmir tremor of 2005 which killed 73,000. The toll is expected to rise further as rescue teams dig through the rubble of countless flattened mud-brick homes. Teams were struggling to reach some areas, even 40 hours after the quake. The government is preparing to send more than 14,000 tents. Temperatures in the arid region were reaching 42 degrees Celsius (108 Fahrenheit) and many survivors said they were desperate for some relief from the blistering heat. The quake left more than 100,000 people homeless in Arawan, a dirt-poor expanse of land roughly the size of Wales. Tropical depression Twenty is located approximately 713 nm east-southeast of Hanoi, Vietnam. Tropical depression Twenty is forecast to strike Vietnam as a typhoon at about 00:00 GMT on October 1. According to the Saffir-Simpson damage scale the potential property damage and flooding from a storm of Twenty’s strength (category 1) at landfall includes: Storm surge generally 1.2-1.5 metres (4-5 feet) above normal. No real damage to building structures. Damage primarily to unanchored mobile homes, shrubbery, and trees. Some damage to poorly constructed signs. Some coastal road flooding and minor pier damage. There is also the potential for flooding further inland due to heavy rain. Russia – Floods and mudslides caused by heavy rain have prompted Russian authorities to introduce a state of emergency in Sochi, the host city of the 2014 Winter Olympics. The Emergency Situations Ministry said Wednesday that about 1,800 of its personnel were involved in cleaning up the streets and pumping out water after the torrential rain caused local rivers to overfill and flood some sections of highways and a few residential areas in the Black Sea resort.